The destroyer Donald Cook, permanently based on the Spanish naval base Rota, moored yesterday in the Odessa seaport. Right up to the arrival in the hero-city of the president of Ukraine, Petro Poroshenko, to the warship with three hundred people, the teams did not even allow Ukrainian journalists (some of our colleagues had time to complain about the “MK”). Today, the “gateways” finally opened. It turned out that the destroyer is commanded by the great-grandson of the Ukrainian émigré. Matthew Powell – that is the name of this very commander – said, in particular, that the motto of his subordinates, “fearless faith”, was chosen in honor of the “fearless marine” colonel Donald Cook. The 4th generation US destroyer squadron arrived at the Ukrainian port with 96 Tomahawk guided cruise missiles. The distance of each of them is up to 2500 km, they are capable of carrying nuclear charges. The reason for the appearance of the destroyer in Odessa is “the escalation of tension and the threat of a new aggression of Russia”. Donald Cook will participate in naval exercises with the ships of Ukraine and other US naval allies. As US State Department Special Representative Kurt Walker emphasized, his country “seriously undertook to control Russia in the Black Sea.” The injured Poroshenko, who met with him on board, developed a thought: the arrival of an American ship is “an important response to an unprovoked attack and an act of aggression against Ukrainian ships.” I had in mind the incident on November 25, during which three small Ukrainian warships tried to pass through the Kerch Strait, but were stopped by the maritime border guards of the FSB of the Russian Federation. According to the Montreux Convention (adopted back in 1936 at the International Conference on the Regime of the Black Sea Straits), only the military vessels of the Black Sea countries are entitled to be in the Black Sea on a permanent basis. Consequently, the Americans will soon have to leave the Black Sea. It is also impossible to send an armada of aircraft carriers to the Russian Crimea (as Ukrainian Ukrainian patriots dream about around the clock). The Montreux Convention allows only relatively small ships to be brought into the sea. 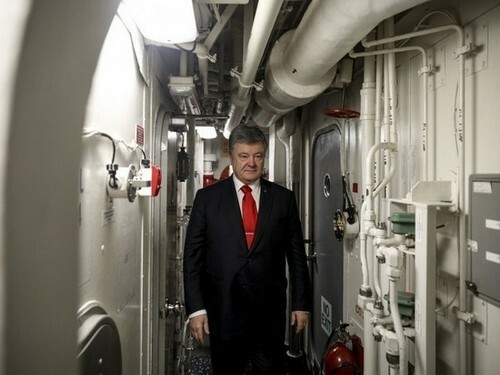 Poroshenko, as it is easy to guess, several times argued for the need to periodically send to Odessa at least a couple of ships of the 6th (Mediterranean) US fleet. In 2017, NATO patrol teams stayed in the Black Sea for a total of 80 days. In 2018, they “stayed” for 120 days. In the beginning of 2019, it is obviously appropriate to expect an even longer duration of the missions of the navies of the NATO countries near the Crimea and Sevastopol. … Today, the Great Belt Strait passed another US missile destroyer – USS Gravely (DDG-107); the ship moves across the Baltic along the coast of Germany in the direction of the ports of the former Soviet Baltic republics. Gravely is able to carry on board 56 Tomahawk cruise missiles with a range of 1.6 thousand km, it is armed with the Aegis missile defense system.